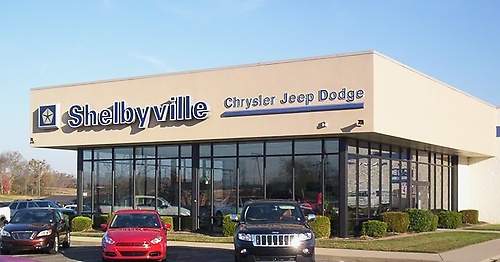 Shelbyville Chrysler Products is proud to serve the Shelbyville, Louisville, Frankfort and Lyndon, KY region with quality Chrysler, Jeep, Ram and Dodge vehicles. With models like the RAM 1500, Chrysler 200, Jeep Wrangler, Grand Cherokee and Dodge Challenger, we carry vehicles to fit anyone's needs. Come visit us at 2121 Midland Trail in Shelbyville, KY and test drive a new or used car. We carry a variety of Louisville used cars for you to choose from, all of which have gone through our detailed quality inspection before being made available for sale. We offer auto financing services so you can get into the new or used car you want without a problem. Shelbyville Chrysler Products is not just your greater Louisville Chrysler, Jeep, Ram and Dodge dealership, we have a full service auto repair shop so you can get the best care for your new or used car. Whether you need auto repair, scheduled service maintenance or auto parts, we are ready to be your first and only choice for quality work on your car. Stop by our showroom and see the latest additions to our Louisville area Chrysler, Jeep, Ram and Dodge dealership, or give us call today!